Decorate pumpkins using our Made by Me™ Pottery Wheel for a cool abstract look! Step 1. Place the pumpkin in the middle of the pottery wheel and turn it on. Step 2. Fill the dropper with a mix of acrylic paint and water. Step 3. As the pumpkin spins, squeeze the paint out of the dropper to create an abstract look on the pumpkin. Step 4. When changing paint colors, be sure to rinse the dropper with water. Step 2. 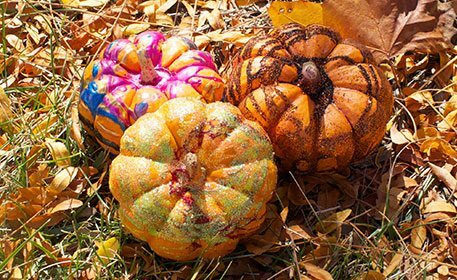 SImply squeeze the different colors of glitter glue onto your pumpkin as it spins. Step 2. As it spins, squeeze a hefty amount of craft glue over it. Step 3. Sprinkle black and orange glitter until the pumpkin appears to be covered.